HMRC Crime Map and "Most Wanted" posters show where the Taxation Action is, and where it isn't. Just as you can judge a person by the company he keeps, you can judge an enforcement agency by the villains it confronts. America's FBI chases the most murderous crooks of their times: Al Capone; Bonnie & Clyde; John Dilinger; the Unabomber. 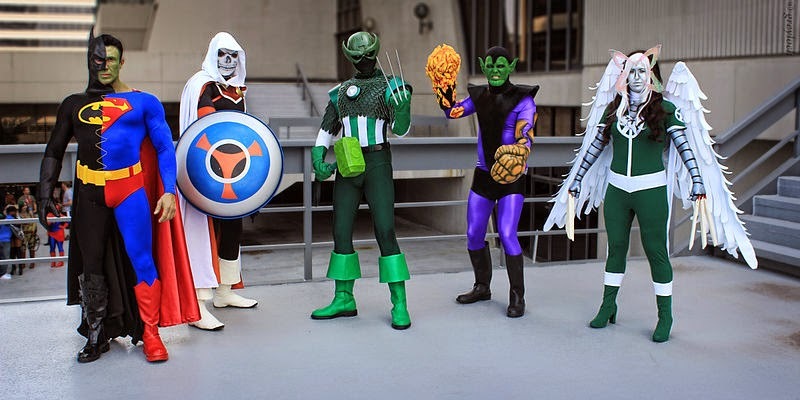 Comic book heroes pursue the vilest vicious verminous villains violently. and an individual who was smuggling non-EU garlic disguised as ginger! These were, incredibly, HMRC's eight "Most Wanted"! They were more wanted than anybody else HMRC could think of. The garlic smuggler was "More Wanted" than the HSBC and the Pricewaterhouse Coopers (PWC) executives who were accused by MPs of running tax dodging scams on an "industrial scale". Perhaps HMRC doesn't include the pin-stripe villains in their "Most Wanted" because they know where they are, i.e. they are not 'on the run'. Though perhaps the suits aren't 'on the run' because they know there isn't anybody chasing them? If it is true that the 'most wanted' only include 'on the runs', then take a look at HMRC's "Crime Map". This shows geographically where HMRC is getting its convictions, and what jail time is being inflicted. The map should show the captured pin-stripe crooks who are not 'on the run'. 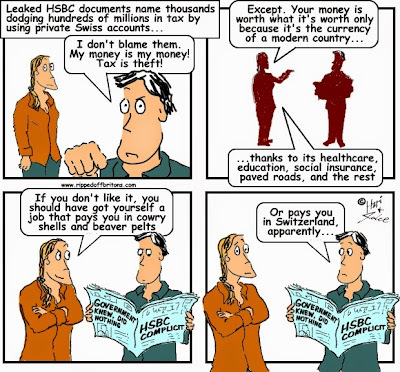 According to the BBC Panorama programme, HSBC's Swiss arm took care of US$21.7 billion of assets for clients from the UK, representing hundreds of millions in dodged taxes. I will leave the mathematicians among you to do the extrapolations to determine jail terms proportionate to the sentences given to the VAT and duty dodgers' listed above. 1) The City: there were no blue balloons at all. 2) Canary Wharf: Also a blue-balloon-free-zone. Bragging rights went to Kevin Nicholson of PwC and John Dixon of Ernst&Young. Mr.Dodwell and Miss McCormick took as consolation prize the ammunition to get a pay-rise at their next appraisals. All for helping people dodge tax. Doubtless the bosses in charge of HSBC Suisse were no less remunerated. History has showed for millenia that if you offer enough, people are prepared to do anything. Napolean did it with ribbons and medals. Our financiers prefer hard cash. Is that the reason certain salaries in the City are so high? They are not paid for their talent, but for their consciences? Top bankers and accountants aren't prepared to sell their souls at any price: only for a high price. Gilbert Tax Consultants had played a significant role in the success of my business because they always provided the best tax advice for my start-up company.